A Ksav Yad Kodesh from the Lubavitcher Rebbe זי"ע that explains why sometimes Roshei Teivos from well-meaning people go against the idea and can hurt the cause. "תמצית מאמרי הרבי על חנוכה"
First of all, thank you to Reb Hirshel Tzig for publishing this guest post so that I can share some information and thoughts about my rebbe, Rav Moshe Weinberger, shlita, who I see as one of the greatest mashpi'im in our generation. 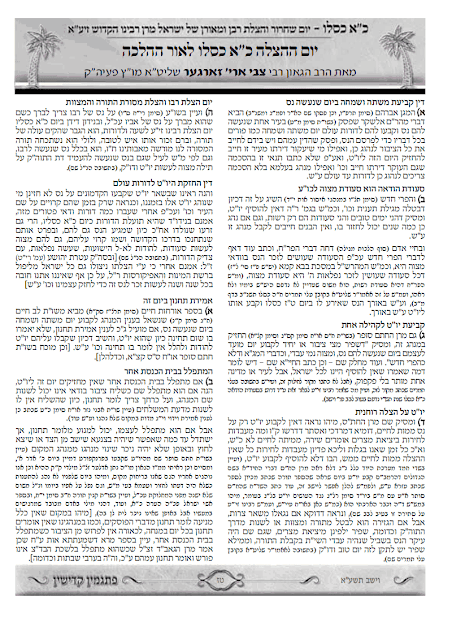 I do this with the recognition that although it is absurd for an ant like myself to "explain" Rav Weinberger to those who are not yet familiar with him, the comment section of Reb Hirshel Tzig's recent post about the inspiring Rosh Chodesh Kislev farbrengen held at YU convinced me that many Circus Tent readers may benefit from some additional insight into this very special Rav. 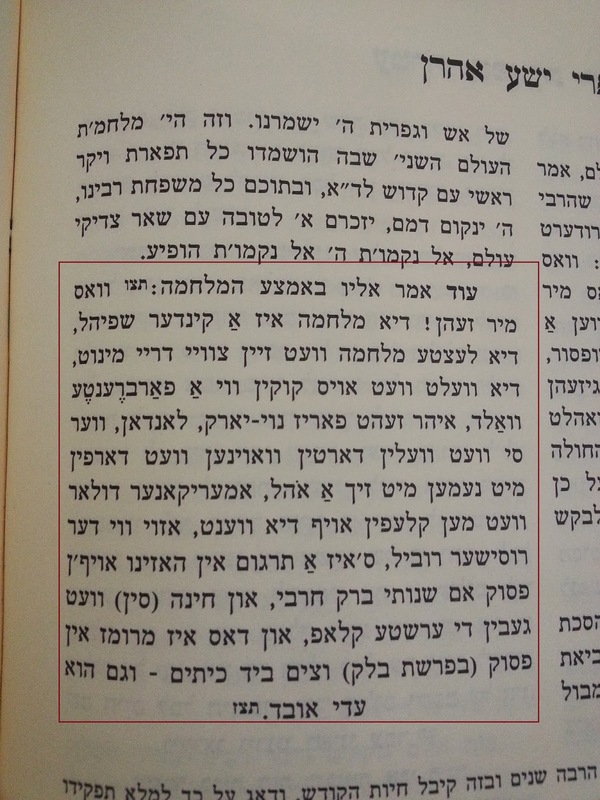 My biggest hurdle is, as Rav Weinberger said about Rav Kalonymous Kalmish Shapira, Hy"d, the "Aish Kodesh," at that tzadik's hilula a few years ago, is "For those who are not yet familiar with his teachings, how does one explain that this [is] not 'just another rabbi?'" The only way for readers to truly get a sense of why Rav Weinberger's teachings are so vital for our generation is by listening to at least one series of his shiurim. I recommend starting with one of the series of shiurim on the teachings of the Baal Hatanya, Bilvavi Mishkan Evneh, or Rav Kook. 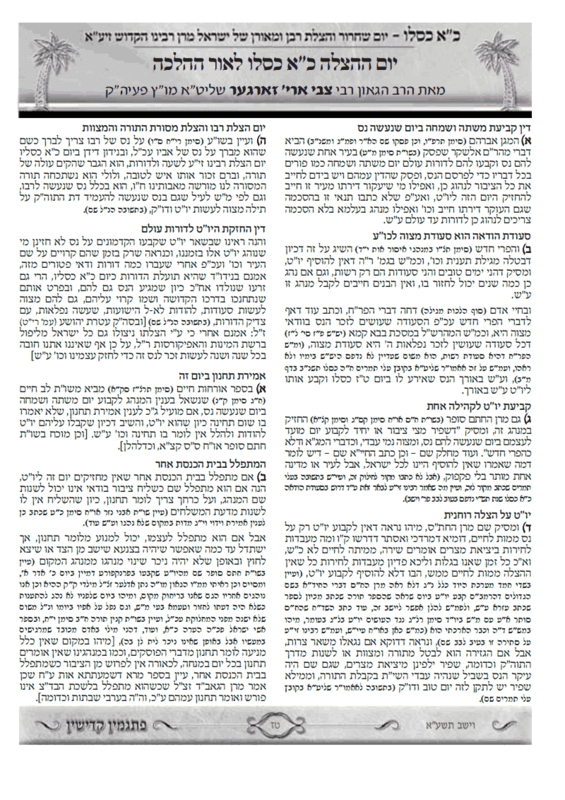 You can also read some of his recent Shabbos morning drashos on my blog here. Nevertheless, I will try to hit a few roshei perkaim and point those interested in learning more toward some helpful sources. My only basis for speaking on the issue is the fact that I have been a student of Rav Weinberger's in Woodmere for about nine years and a student-from-afar of Rav Weinberger's for about twelve years. Readers should note that the views I express here are my own and I am not an "official" spokesperson or gabai for Rav Weinberger. Any mistakes in attempting to characterize Rav Weinberger's teachings are my own. Rav Weinberger's teachings are not penimius/derech arucha u'tzetzara. They're "Poilishe bubeh maasehs," fireworks, and pomp to appeal to the masses and are without tochen. 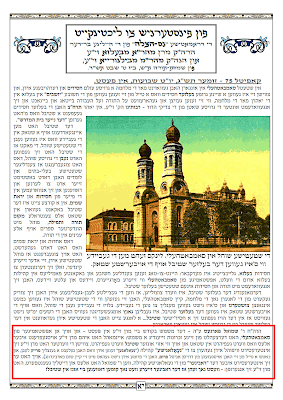 How can a Rav who learned in YU and is "worldly" credibly be considered a "Rebbe?" 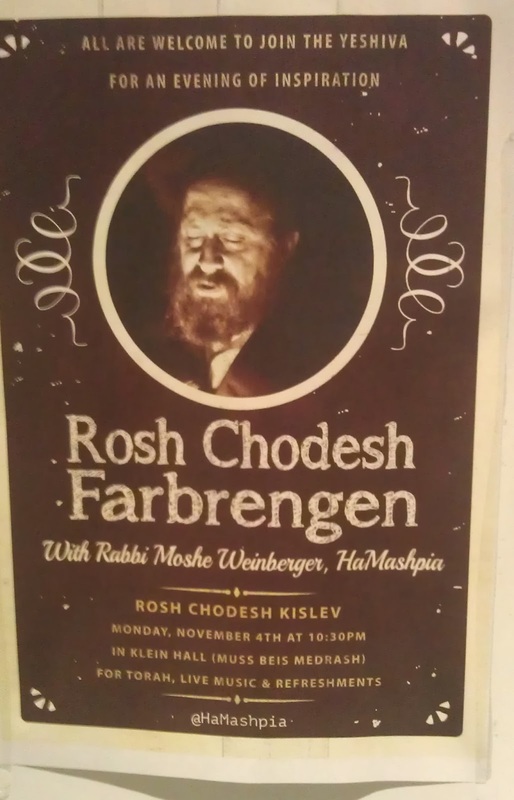 It is problematic that Rav Weinberger does not limit his self-identification and teachings to Chabad chassidus. 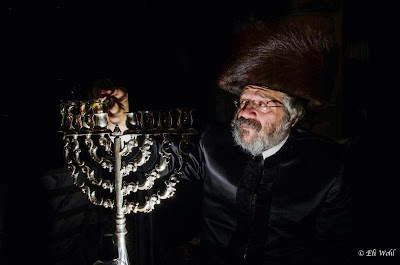 I understand that in Chabad communities, it is widely held that any derech/Torah from outside of the world of Chabad is, at best, a pale shaddow of Chabad chassidus and, at worst, klipa and sitra achra incarnate (the "Chabad First" view). To the extent one categorically believes this, there is nothing for me to say. While Rav Weinberger learns, teaches, and lives Chabad chassidus on a level very few in the generation can match and looks to the most recent Lubavitcher Rebbe, zy"a, as one of the greatest tzadikim of the generation, he does not "limit" himself to Chabad chassidus, as great as it is. He once commented to me regarding this view (even if it were applied to Breslov, Rav Kook, or any other derech), that he feels bad for those who water their spiritual garden from only one wellspring because they lack the wide variety of nourishment available in the wellsprings of other tzadikim. Those who subscribe to the Chabad First view disagree. 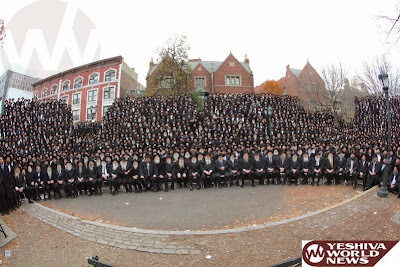 They believe anything anyone else has to offer is already included within Chabad chassidus, so they are not "limited" in any way and lack nothing. As I said before, there is nothing I can say to those who subscribe to this view. IY"H, we can just agree to disagree. It is problematic that Rav Weinberger cannot be pinned down to clear Chabad/Chagas/MO/Litvish labels. I sympathize with those who are baffled by their inability to pin Rav Weinberger down to one derech or label. The urge to label is very strong and many people feel great anxiety and mistrust toward anyone they cannot pin down to a certain "type." It is true. 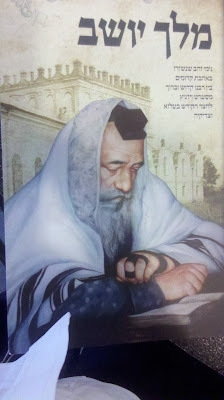 I see Rav Weinberger himself and his teachings as containing everything within them. He is both Chabad and Chagas, Chabad and Breslov, Satmar and Rav Kook, Chassidish and Litvish, Ashkenazi and Sefardi. This is one of the reasons his teachings resonate such a wide spectrum of people in this generation. 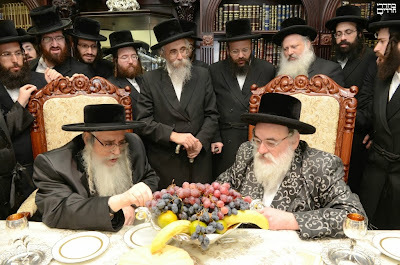 While most people in the Litvish, Chassidish, and modern orthodox camps view each derech as being mutual exclusive to one another, Rav Weinberger is one of the great neshamos and minds of the generation (though certainly not the first in history) who can master them all and, from a higher perspective, see and explain how each divergent viewpoint and shita is emes according to its own bechina/shoresh under the principle that "Elu v'elu divrei Elokim Chaim." A comprehensive explanation of this wondrous but difficult-to-understand perspective is beyond this scope of this short post. But I recommend that readers who want to begin understanding this concept start by reading my translation of a fundamental principle undergirding this "klaliyusdik" viewpoint from the 5th volume of Bilvavi Mishkan Evneh. 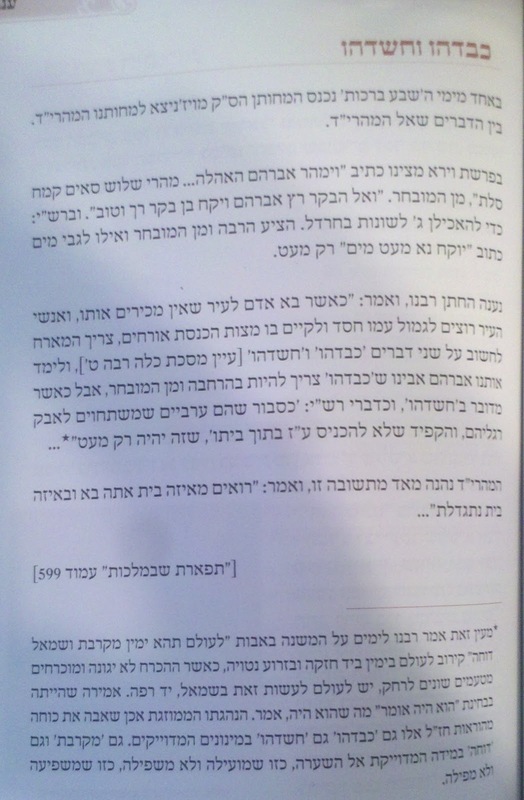 Also, I recommend reading my translation of a maamar on Chochma and Bina from Rav Itchie Mayer Morgenstern, shlita, which Rav Weinberger taught a few years ago. Just click through from one post to the next (7 posts). Rav Weinberger's teachings are not penimius/derech arucha u'tzetzara. They're "Poilishe bubeh maasehs," fireworks, and pomp to appeal to the masses and are without tochen. I put this category in the "Rav Weinberger is not Chabad" complaint category because I think this false impression is based largely on the assumption that any non-Chabad rav is ipso-facto a teacher of fantastical stories, short-lived inspiration, and superficial vert'lach. This complaint is simply based on a lack of knowledge. If one listens to any series of shiurim linked-to above, this misconception will evaporate. Readers should also not lend much credence to the few examples of supposedly fantastical statements quoted by commenters to Reb Hirshel Tzig's post because they are based on a tiny sampling of introductory shiurim given during Rav Weinberger's first few weeks at YU. Rav Weinberger is at Aish Kodesh and at YU (presumably) for the long haul. Although it is silly that I even "need" to say it, Rav Weinberger is only here to teach the "derech arucha u'ketzara." It's all about teaching inner work on a long-term basis, teaching us to connect to the G-dliness within. He teaches "avodah," not "hisorerus." The wondrous events he sometimes recounts, in my view, are there to dispel popular misconceptions about chassidus and wake people up who think it is all about a set of customs and dress code, speaking Yiddish, or nice but shallow stories and vert'lach. In order that the students understand that they don't already understand what chassidus is, he is telling the YU guys, "It's not about that superficial stuff. There is something very big here! This is worth your attention!" If someone doesn't even know chassidus and pnimius Hatorah have something substantive to offer, they'll never know to search there for the deeper meaning his soul craves. YU should be ctiticized for hiring a chasidish mashgiach and thereby abandoning its Brisker/Litvish/RYB Soloveitchik heritage. 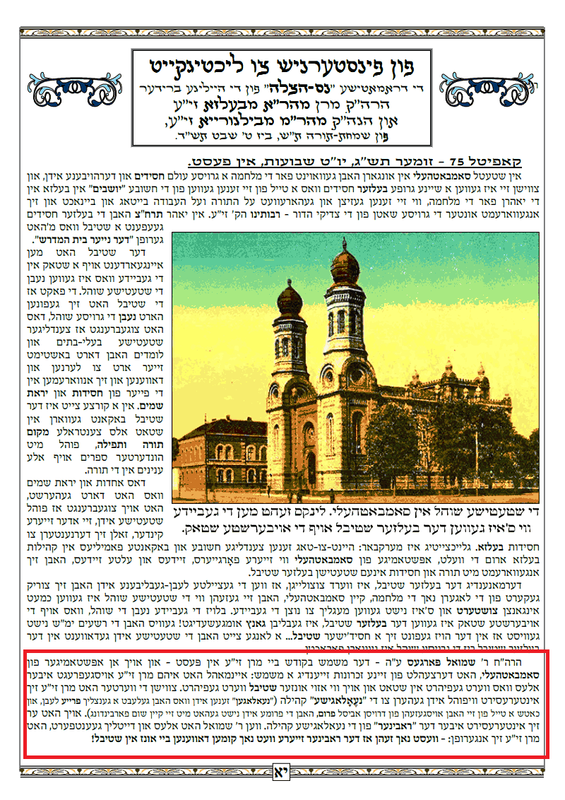 First, to get the to real heart of this complaint (i.e., not the merits of the complaint as expressed), I also place this issue in the "Rav Weinberger is not Chabad" complaint category because I find it difficult to believe that the commenters focused on this issue are old-time RIETS musmachim upset about the direction of the yeshiva. 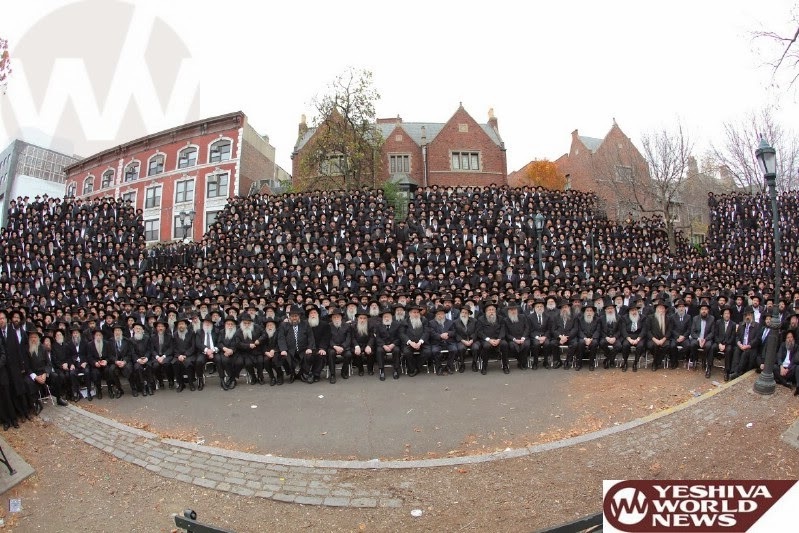 Most if not all of them are presumably Chabad/from outside the traditional YU population. One must ask himself why outsiders would be so incredibly concerned about the purity of the Brisker derech in YU. Ultimately, the most likely explanation is that people are bothered by the fact that someone other than a Chabad chossid is turning the YU guys onto pnimius Hatorah. Under the Chabad First theory, non-Chabadnicks are suspect by definition. This suspicion therefore leads to any of the various permutations of the "purity of YU's Brisker heritage" complaints found in the comment section. Second, I think it's important to address the merits as well because there are academic-types and Brisker purists who also share this complaint. In different ways, I believe it is both true and false. It is true in the sense that YU institutionally is generally a kalter Litvak sort of place and has probably always been that way (for the record, I went to YU and had a wonderful experience). So in that sense, on a practical level, this is a clear departure from the past and introducing someone who teaches that Yiddishkeit and Torah must live in the heart as well as the mind is an innovation not consistent with the past. But I disagree that it is a reason to complain. 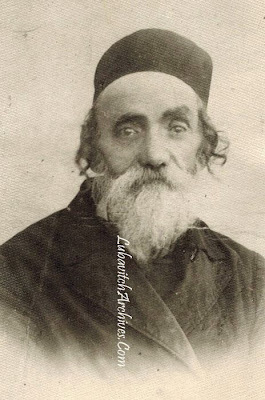 There is a famous story about Reb Noach of Lechovitch. The chassidim noticed that he did not continue all of the hanhagos of his father, the previous Rebbe. When, upset, they asked him why, he said, “To the contrary, I’m doing exactly what my father did. My father did not copy anyone, and I do not copy anyone.” Merely sticking with what one has done in the past because that is how it was "always done" is just as much of a falacy as changing something just for the sake of change. I recommend that you read Rav Weinberger's drasha from parshas Chukas where he explains how Hashem provides different leaders in each generation according to the needs and shoresh of that generation in the context of Moshe and Yehoshua. The yeshiva is continuing its path of rigorous shiurim, which are packed as always. But the body of Torah without the soul is hollow and empty. Simple or deep nigleh alone will not satisfy many in this generation just before Moshiach's arrival. Toraso shel Moshiach is what the generation is thirting for, which is why Rav Weinberger was received so enthusastically every time he spoke at YU as a guest speaker and why they ultimately asked him to join as mashgiach. The yeshiva is wise to bring on someone who knows how to fulfill the needs of the generation. Each generation is different. The fact that the yeshiva, at least to some extent, recognizes this is to its credit. Comments which question how a Rav who learned in YU and is "worldly" could credibly be considered a "Rebbe." 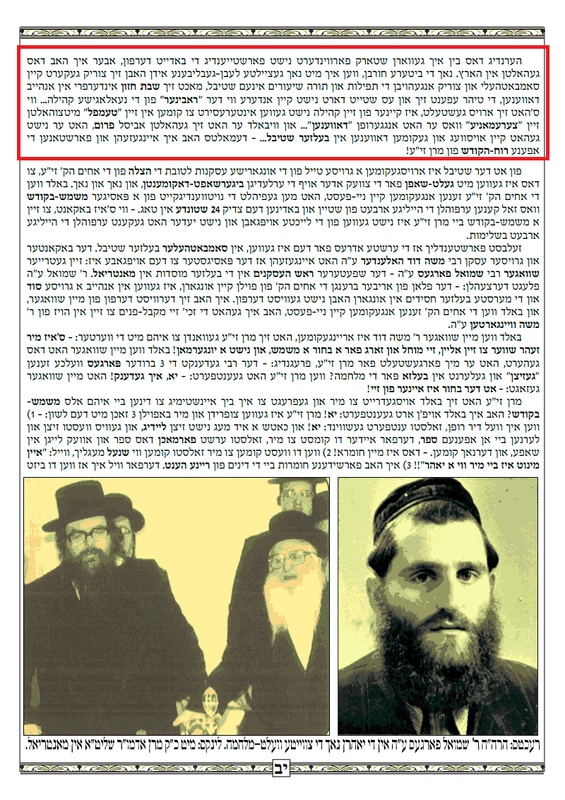 As one of the commenters correctly pointed out, Rav Weinberger has never conducted himself or called himself a "Rebbe." People may very often treat him, in one way or another, similar to a Rebbe because of his greatness as a Rav, mashpia, and posek. This is the natural response to the greatness of a Rav and tzadik who certainly does not need to "ask" for such treatment. To the extent anyone fargins Rav Weinberger his style of speaking or teaching, I would ask: Would anyone have him not teach or not identify with chassidus because of his background despite the fact that doing would violate his own essence? Should he not teach chassidus to the world? Can someone with water refrain from giving a thirsty man a drink because he did not grow up as a restaurateur? 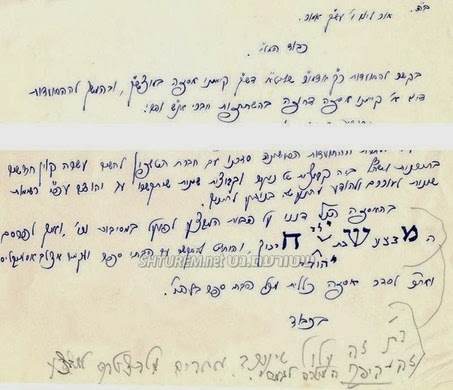 And as one commenter, Schneur, wisely pointed out, "[T]here was another Rebbe who attended a secular university and was worldly and became a well known rebbe..."
Rav Weinberger appeals to the chevra at YU because because they are starved for spirituality. I agree with this but not with the potential underlying assumptions. First, the comment may assume that people are starving at YU but not elsewhere. This is certainly not true, and the YU crowd certainly has no monopoly on empty, checklist-style Yiddishkeit. My experience tells me that it is perhaps even slightly less of a problem at YU than elsewhere. All chevra from every group are starving for something deeper, for a Yiddishkeit that is not built around societal expectations and what the neighbors will think. 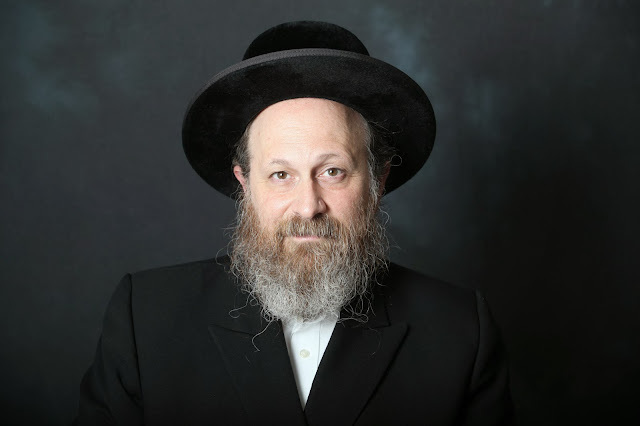 Rav Weinberger understands our generation and is an expert at communicating avodah pnimis and pnimius Hatorah to people from a modern orthodox, yeshivish, or chassidish background. There are others in our generation who do the same thing for some of the same populations, like Reb Tzvi Mayer Zilberberg, Rav Itchie Mayer Morgenstern, the Stechiner Rov, and Rav Kluger. But different mashpi'im appeal to different people and each person should drink the waters of the tzadik who speaks to the essence of his own unique soul. Kein yirbu! The second mistaken assumption which may underlie this comment is that because the YU folks are so starved for spirituality, they will settle even for "moldy bread." While this point is not really worthy of a response because it can only arise from a complete lack of knowledge, suffice it to say, as already explained above, this preconception will be dispelled by anyone who seriously takes the time to listen to a series or two of Rav Weinberger's shiurim. This comment/assumption is also probably predicated on the Chabad First outlook referenced above. If one views any non-Chabad rav as, by definition, "moldy bread," then there is nothing that I can say to dispell such a person of his views. Rav Weinberger appeals to the chevra at YU because because he teaches Rav Kook. As in the previous point, I partly agree and partly disagree with this comment. On a superficial level, I understand why people would say this. The thinking goes that because Rav Kook was a "Zionist" and because the MO folks are "Zionists," Rav Weinberger is more appealing to them because he teaches Rav Kook. Again, on the surface level, that may be true for some people in the MO camp who know very little about Rav Kook. But many people even in that world recognize that Rav Kook was sooo much more than "Zionism." That is one piece of a larger, klaliyusdik, pnimius Hatorah, Moshiach-tzeit outlook on the world which was taught by Rav Kook. While Rav Kook is so amazingly awesome and deep, his approach does not exactly square with YU's Litvish and MO background. Therefore, I'm not sure how much of a selling point the Rav Kook part is before one has already given it a chance and seen how Rav Kook is the deepest of the deep and speaks to the essence of our generation. While I have not addressed every point in the comments, I hope that by addressing many of the categories of such comments, I have at least provided a few ma'areh mekomos for those who are interested in understanding and exploring Rav Weinberger and why his Torah resonates so deeply with our generation. I wonder what the late Ponovizher Rosh Yeshiva would say about his good friend the Satmar Rov and the new "hag" that his Chassidim made. Is this too a חג שבדה מלבם? Is it as bad as י"ט כסלו? Are these הלכות as good as Reb Meshulom Roth's פסקים regarding saying הלל ביום העמצאות? און זיי נוצען אלץ ראי'ה אן "אגודיסטישע" רב פון וויען-טאראנטא, הרב שמעון פירסט ז"ל. כ'ווייס נישט ווער דער גרינבוים איז. חפשתי ולא מצאתי דער ספר "עיר הגולה" פון הרב פירסט, אזוי ארום אז ס'איז שווער צו וויסען צו ער זאגט טאקע אזוי אין זיין ספר, צו איז דאס סתם א בלבול. ס'איז שווער צו גלייבען אז ער שרייבט אזוי, ווייל אינעם זעלבן מחבר'ס ספרים האט ער הסכמות פון הגאון ר' משה פיינשטיין זצ"ל, דער נשיא פון אגודת הרבנים... קומט אויס אזוי: דער סאטמאר רב האט כידוע באשולדיגט די ציונים אין וועלן אז מ'זאל אויסהרגענען אייראפעישען אידנטום "כי רק בדם יהי' לנו הארץ," דאס ווייסט יעדער בחור אין סאטמאר. עד היום האט מען אבער געמיינט אז די אגודה, ובראשם דער סאטמאר רב'ס ידיד נאמן הרב אהרן קטלר, האט יא געטוהן וואס נאר זיי האבען געקענט. געראטעוועט ישיבה בחורים, רבנים, און ראשי ישיבה. היינט אבער זעהט מען אז דאס וואס דער רבי ז"ל האט געזאגט אז "ציוניסטן, מזרחיסטן, אגודיסטן ימש"ו" איז נישט סתם א הלצה בעלמא, נאר די אגודה איז געווען בדעה אחת מיט די ציונים און האט אויך נישט געוואלט ראטעווען אידן! זיי האבען נאר געוואלט געלט און כבוד, און ווען נישט דער בחור'ל וואס בלאנדזשעט אריין אינעם ביורא פון אגוה"ר וואלט מען די הונדערט טויזנט טאלער נישט צונויפגעקליבען און מ'וואלט די מענטשען נישט געראטעוועט. זעהט די פערטער שטיקל, "די אגודה האט אויך פארשוויגן" ותמצא נחת. אוי לנו אז אזוי איז מען מחנך אינגע אידישע קינדער, און אוי להם לאחיי ורעיי חסידי ותלמידי סאטמאר אז ביי די אלטע לייט ווערט מקויים דער מאמר חז"ל זקני ע"ה כל זמן שמזקינין דעתן מטורפת עליהן. Sources from the farbrengen tell me it was an unbelievable sight. Dancing with a jam-packed crowd singing the Rosh Chodesh Kislev niggun! The air was electric. The crowd was estimated at 200 people! 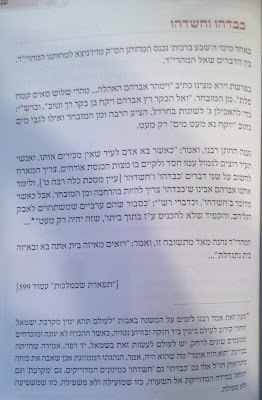 From a new sefer by Dudi Zilbershlag about the Sereter Rebbe's days in Belz, which ended a bit soon with his divorce. 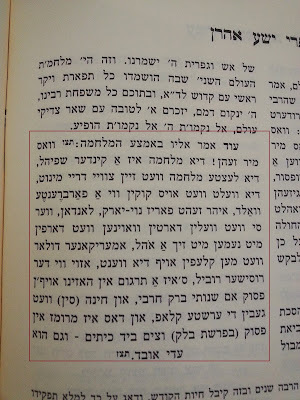 We learn two nice things here (actually, we already knew the first thing, but it's nice and reassuring to see again and again: That 1) not for nothing was he called the Ahavas Yisroel, and 2) that the Belzer Rov (מהרי"ד) was no zealot, as some, ahem, would like to portray him. So Rick Jacobs, URJ President, was a guest at the Kinus HaShluchim Banquet last night. Now they have what to speak about at the AI convention later this month. 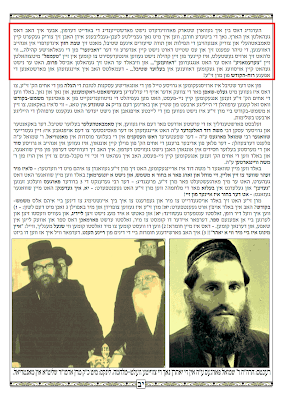 Lubavitch sees it as a major "כיבוש"
In other, more important news, The Sanzer Rebbe visited the Vizhnitzer (Mendel) Rebbe. Hands were shaken, wine was poured into silver goblets, and mounds of grapes, both red and green, were served. The Rebbetzin's yummiest lemon meringue pie was served on her finest bone china. A few anecdotes about deceased grandfathers and maybe even grandmothers were exchanged, and parting words were said, with eyes rolling in ecstasy. According to some people this is how REAL Jewish leaders should be spending their time, not trying to affect actual change in Judaism. This is what Rebbes should be doing with their time.